We’ve all been there as homeowners — we see a job that needs done around the house and we immediately think we can handle it ourselves. We say, “I can do this project without anybody’s help.” While this mindset may work with certain home-based projects, it’s not a great approach to plumbing projects. In fact, we recommend steering clear of DIY plumbing projects for a variety of reasons. Let’s take a closer look at some the dangers to DIY plumbing. Let’s start off with the tools that it takes to complete most plumbing work. Without the right tools, you risk doing the work improperly, potentially causing further damage. 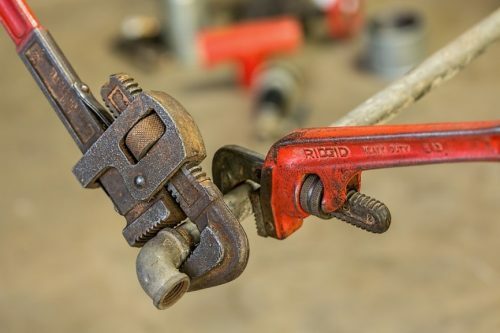 Plumbing experts are equipped with various pipe wrenches, channel locks, hole saws, drain augers, rib-joint pliers, fire-resistant cloths and more. If you are dealing with plumbing in an area that is tied in closely with electricity (such as a bathroom or kitchen), there are safety aspects that need to be considered. This is where an experienced plumbing expert can properly assess the situation and make the proper plumbing adjustments that will ensure the safety of your home. For example, a plumbing expert will be sure to install GFCI outlets – or Ground Fault Circuit Interrupters – in all wet or damp locations, such as bathrooms, kitchens or basements. If you do not install these properly in the correct locations of your home, this could lead to serious electrical damage due to water contact. There’s nothing wrong with DIY projects every now and then around the home. Fixing a squeaky door or painting the kitchen are projects that every homeowner can attempt with a little time and effort. However, plumbing projects are on another level. If you do not perform the work properly, you could end up with major water-related damage that can lead to thousands of dollars of damage. For example, let’s say you are sealing a leaky pipe in your basement. If you do not properly seal it, there’s a chance that this leak could return in the future – and it could be an even bigger leak! If you don’t notice the leak in time, water damage can do some major damage to your basement. The risk associated with DIY plumbing is not worth it. Bring in a licensed plumbing expert to ensure the job is done right. Download the FREE Repairman app today to get connected with a plumbing expert in your area. The Repairman app can also help you find professionals in a variety of other services such as window repair, HVAC, electricians, and roofing. For the latest news and updates, sign up to our newsletter. If you are looking for more home improvement topics to tackle, you can learn more by reading the rest of our blog.